It’s hard to “Be the Voice” when you’re thirsty. 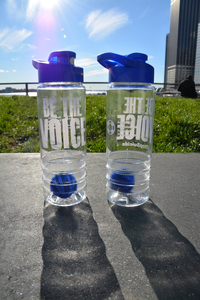 This practical and aesthetically pleasing clear Be the Voice Water Bottle with a royal blue top and mixing ball, features the American Foundation for Suicide Prevention’s logo opposite a larger “Be the Voice: #StopSuicide” logo. Perfect for your next Out of the Darkness Walk or any time you want to wet your whistle while on the go. Holds 24oz. Dishwasher safe and BPA free.